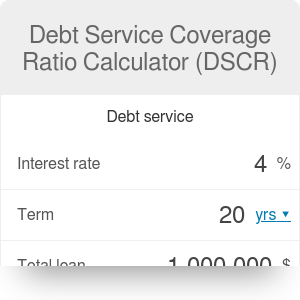 This debt service coverage ratio calculator, or DSCR calculator for short, measures whether your incoming cash flows are sufficient to pay back a debt. It is most commonly used by commercial lenders to determine if, thanks to this loan, the borrower will be able to generate an adequate return on investment. You can start using this debt service coverage ratio calculator straightaway, or read on for a more thorough explanation of how to calculate DSCR and how to interpret the result. Besides, you may use DSCR calculator with our Cap Rate Calculator to support your investment decisions on the real estate market. DSCR stands for debt service coverage ratio. It is a metric commonly used in commercial lending (instead of personal credit scoring) to establish whether the borrower's investment makes sense from an economic point of view. In contrast to private purchases, commercial mortgages are taken with one main objective in mind: to generate income. For example, you, as a real estate agent, might consider buying a building in order to rent out the apartments. The rent paid by the tenants will have to cover the loan you've taken (with interest) and provide you with some profit. Your lender won't be interested in your credit history: he will be interested in predicted cash flows to ensure that you won't run out of money to pay him off. debt service is the monthly payment towards paying off your debts. vacancy is the vacancy rate (how often you don't have a tenant for the apartment), expressed as a percentage of the gross income. T is the number of years in which you have to pay the loan back. Your lender will probably use the DSCR to decide whether you should get the loan or not. The common minimum acceptable DSCR is 1.20; if you're below this value, you will probably be rejected as a potential borrower. On the other hand, if your DSCR is substantially higher, you might get your loan faster than you'd expect! Debt Service Coverage Ratio Calculator (DSCR) can be embedded on your website to enrich the content you wrote and make it easier for your visitors to understand your message.